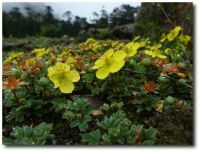 This is a travel account of the trip to Yumthang Valley in Sikkim made by Thingnam Girija, N. Ullysess and Tabish, basically to find Himalayan flowers, for the website, Flowers of India. Yumthang Valley is a beautiful valley situated in north Sikkim. 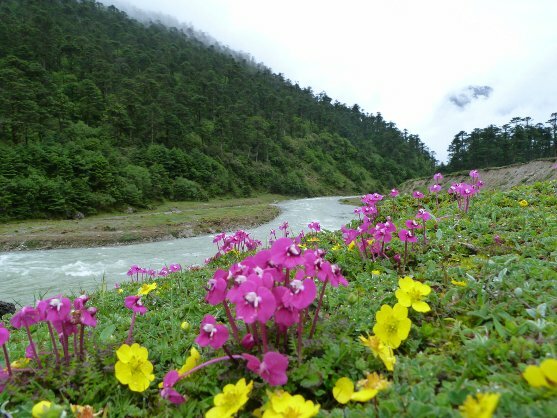 It sits at an elevation of 3,500 metres above sea-level, so naturally home to many beautiful Himalayan flowers. 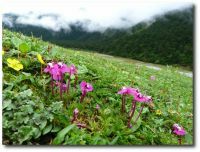 It is rightfully called a valley of flowers, although that name is associated with the Valley of Flowers in Uttarakhand. Yumthang Valley is extremely picturesque, with green slopes covered with trees, yaks grazing in the flower-spangled grassy plains below, and a river flowing right through the valley. The serene and tranquil air of the Valley cannot be described in words. A single visit there can leave the visitor in an enchanted state for weeks. Large versions of the small pictures can be viewed by just moving your mouse over the smaller pictures. But for this to work, all the big pictures have to load first, which takes a little time - so, be patient. 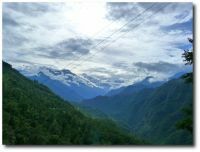 There is no direct way of going to Yumthang Valley - one has to first go to the capital, Gangtok, and get permission to go to the Valley. Yes, everybody needs permission to go to the Valley because of its proximity with the Indo-China border. But first one has to reach Gangtok. If you are travelling by air, which is getting cheaper now-a-days, you should take a flight to Bagdogra in West Bengal, a town which mostly serves as a connecting point to Sikkim and Darjeeling. From inside the Bagdogra airport, one can get a prepaid taxi to Gangtok for around Rs. 2000. Gangtok is 124 km from Bagdogra, and by road it takes about 4 hours to reach there. If you are travelling by rail, the nearest railways station is New Jalpaiguri in West Bengal. All major trains going towards Guwahati, pass through New Jalpaiguri. Coming from Bihar side, you reach New Jalpaiguri just after passing through the "Chicken's Neck" that connects NE India, with the rest of India. Gangtok is 148 km by road from New Jalpaiguri. Gangtok is a surprisingly polished town of NE India. The M.G. Marg (Mahatma Gandhi marg), which is an equivalent of the "Mall roads" of various hill-station, is really modernized. Go to M.G. Marg to look for a place to stay. If you are looking for somewhat cheaper place, walk a bit uphill from the M.G. Marg and explore the various hotels there. So, we reached Gangtok and check into a hotel. After a brief rest, we straightaway head to a travel-agency to book a trip to Yumthang Valley. Yes, you have to go through a travel-agency, and fill out a form, with two passport-size photographs, and a photocopy of your voter-id card, for each passenger. Because the Valley is close to the Indo-China border, a permission is needed before you begin travel towards Yumthang Valley. But don't let that put you off, because you won't have to move a finger apart from filling out the form - everything else will be taken care of by the travel agency. Also, even if you have permission to visit the Valley, the actual permission for the vehicle to go will only come in the morning of the day you are going to travel. That is because of the weather and frequent landslides that block the roads. Only if the route is clear, and the safety of the travel is assured, the authorities give a green signal to go. Assuming that you are going to take a shared vehicle, there are two packages available for Yumthang. One is the two days, one night package which is very popular, and the other one is three days, two nights. The one-night package costs Rs 1,200 per person, which includes travel, stay overnight, and all the meals during the tour. Not a bad deal! The two-nights package costs around Rs 2,200 per person. The only problem is that many a times, there are not enough takers for the two-nights package and the shared vehicle will not go unless all the 10 seats are filled. So you might be forced to take the one-night package, as happened in our case. There is a third option, to book a vehicle just for yourself, plus the other things in the package. That comes to around Rs 20,000 for the two-nights package. You can see the arithmetic, shared Sumo takes 10 people, booking a full vehicle would cost 10 times the shared cost of one passenger. All we got was the one-night package, and the next morning the travel-agent phoned us to inform that the permission has been granted. We pack our luggage, check out of the hotel, and head for the vehicle. If you are going to Yumthang, tavel light! Another thing to keep in mind is to ask the travel-agency which vehicles are they providing. Ten people in a Sumo or Mahindra-MaxX is not uncomfortable, but it is uncomfortable in some, e.g. Bolero. The itinerary is the following. From Gangtok, a 7 hours Sumo travel takes you to Lachung, a small village 24 km before Yumthang Valley. You stay in a hotel arranged by the travel-agency, and enjoy the simple free dinner. Next morning, at 6 AM, start for the Yumthang Valley, which takes about an hour. Come back to Lachung by 11 AM or so, and after an early lunch, start back for Gangtok. 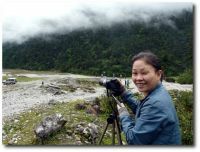 People of Sikkim are very nice and polite. Be gentle to them! Almost all the people driving hired vehicles are the owners of the vehicle, and well-educated too. So, visitors, especially those from Delhi, should mind their attitude. Our journey begins on the hilly road, among lush green mountains, with milky mountain brooks occasionally streaming down the slopes. The journey is quite pleasant, apart from sitting immobile in the Sumo. We break the journey for a cup of tea, and our eyes are already peeled for flower. We scramble to photograph a beautiful white Dendrobium orchid that we had been looking at throughout the journey, hanging from various trees. 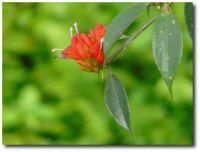 We also see a beautiful pendulous shrub with scarlet tubular flower, which is called the Sikkim Blushwort. We continue the journey, enjoying the views and listening to the music playing in the Sumo. We stop at a dhaba-like place and the pleasant people there are already expecting us, as arranged by the travel-agency. We have a tasty lunch of dal, rice, 3 vegetables and papad. We finish the lunch quickly and walk in search of some flowers before the Sumo starts again. We find a few flowers, and enjoy the greenery, and the smell of vegetation. Close to dark we reach Lachung which is a pretty little village on the hill-side. It has many hotels, serving as transit points for people visiting Yumthang Valley. We dump our luggage in the room and rush off to look for flowers before it get too dark for photography. 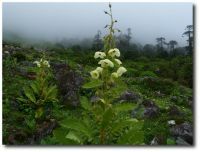 We spot a few flowers which were new to us, a small shrub of white Rhododendron flowers, and the Sikkim Aster. We also spot an apple species found in Sikkim, called Sikkim Crabapple. During the walk we find a dhaba, and ask for tea. It is served with pleasant smiles. We come back to our hotel and the hotel lady is angry that we went and had paid tea, while she had made free tea for us (part of the package). We get up at 5 in the morning, and go for a brisk walk outside. We can seen partially snow-covered peaks close by, and the expanse of greenery is really soothing. In such moments there is an envy for people who stay in this village, and enjoy the beauty and greenery every day. We come back, and a cup of tea is waiting for us. We leave our luggage in the hotel room, and get into the vehicle for the drive to Yumthang Valley. The morning is beautiful and the path is enchanting, passing over mountain streams, with lush slopes on the sides. During the drive we look for flowers, and we spot the Himalayan Yellow Poppy, which we have been search for, for many years. It is a high altitude Himalayan plant. Girija is already breathless with excitement. We see big stretches of Rhododendron forests on both sides of the paths. Rhododendrons are gregarious plants, and a single species covers a big stretch of land. We can see some foot-paths with signboards "Rhododendron niveum trail", "Rhododendron ciliatum trail" etc. 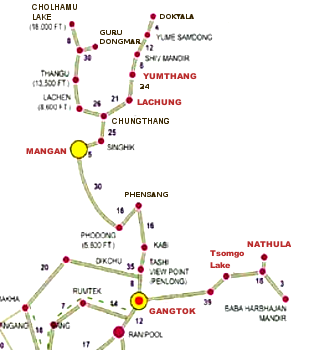 These are trails which people coming to Yumthang in April-May follow. During those months, most of the Rhododendrons are flowering, and it looks like a forest on floral fire. 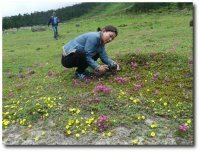 In the present month (June), Rhododendron flowering is over, but the flowering of small Himalayan plants has begun, which we are after. We reach the entrance to Yumthang Valley and get down there. Actually the road goes right through the Valley. There are two rows of dhabas on either side of the road at the entrance. We are supposed to have our free breakfast in one of them. But we decide to explore the Valley first, and break off from the rest of our co-passengers. Entering the Valley, we come across a breathtaking view. A flat grassy valley in the middle, a mountain river flowing through it, and lush green mountains covered with trees and vegetation on both sides. We stand there speechless for a while, taking in the view. Then we climb on to the slopes, to look for flowers. Indeed, the Himalayan Yellow Poppy is right there. 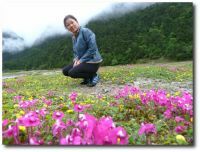 We had travelled to Tawang, and the Valley of Flowers in Uttarakhand, but could not find it. Now here it was, and we photograph it, and get ourselves photographed with it. There are small Pink Scaly Rhododendrons which are still flowering on the slopes. We find another Rhododendron species, with pale yellow bell-shaped flowers, which we cannot identify immediately. Then there are beautiful wildflowers called Avens - we find two varieties with yellow and white flowers. There is a curious looking Griffith's Cobra Lily growing widely there. The flowers look like the hood of a cobra. A closer look reveals more flowers, small in size, but beautiful nevertheless. There are some tiny yellow Buttercups, and some species of Clematis vine. We almost miss the tiny, but extremely pretty flowers called Forget-Me-Not. There are pink Geraniums, unlike any ones we have seen before. The more we explore, the more we find. We spend more than an hour on the slopes, and then decide to come down to the grassy plains. A wonderful sight awaits us there too. The grass throughout the Valley is covered intermittently with tiny pink and yellow flowers. Pink flowers are mostly Pedicularis, commonly called Louseworts, and the yellow ones are Cinqefoils. We stroll through this charming expanse of greenery, dotted with wonderful wildflowers, and watch the river which is flowing through the Valley. 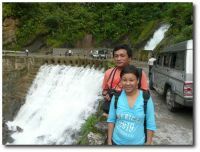 This river actually goes and merges with the Teesta river which flows through Sikkim, and into West Bengal. The tour is supposed to go further to a place called Zero-Point. Zero-Point is at an astounding altitude of more than 5,000 m, and one can find snow even in early June. From there, the flat Tibetan plateau is visible. Our co-passengers turn out to be extremely disinterested - they came to Yumthang without realizing what exactly it was, and are cribbing about there not being much to see and the travel being so long. They are not interested in going to Zero-Point. That suits us too - we want to spend as much time in the Yumthang Valley as we can. We explore the grassy plains and find more flowers. Red Himalayan Strawberries dot the whole expanse, especially the slopes. We know they are edible and pick up a few to eat. Then there are Himalayan roses, which are mostly climbing shrubs, that are there everywhere. There is one with pink flowers, Webb's Rose, and one with white flowers, Silky Rose, with tiny leaves. There are Rhubarb plants with big leaves. For us it is a treasure trove, and nature's paradise. We do not feel like walking out of the paradise, but as it is getting late we walk back to our dhaba, and have a breakfast of tea, bread and jam. We can see there are other stalls, which are also busy catering to other groups which have come to visit Yumthang. Interestingly, the dhaba ladies are all clad in jeans and t-shirts, something we don't expect to see in villages in north-India. Our vehicles starts driving back to Lachung, but we feel we haven't had our fill. We ask the driver to drop us two km before our hotel, and we will walk the rest of the way. We take the stroll back and enjoy the scenery. And we find some new and interesting flowers. There are some showy rose-colored flowers in pendulous clusters. 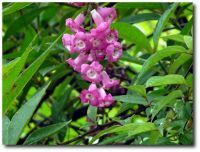 We suspect them of being cultivated garden flowers, but they later turn out to be a rare species of Butterfly-Bush, which is found only in Eastern Himalayas. We find a species of Hydrangea, which grows as a tree. We find a few more flowers new to us. The place amazes us with its floral diversity. We come back to the hotel, rest a bit, and have an early lunch, and start the drive back towards Gangtok. The drive back is uneventful, but shorter because of the downhill travel. We break the journey for a snack, and continue again. 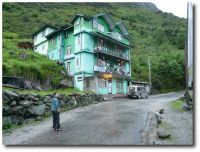 We reach Gangtok in the evening and check into the same hotel that we left. As we lay in our beds after a hot shower, the beautiful flowers of Yumthang Valley and its serene slopes refuse to leave our mental eye. Hours after arriving, we still roam about in an enchanted state.